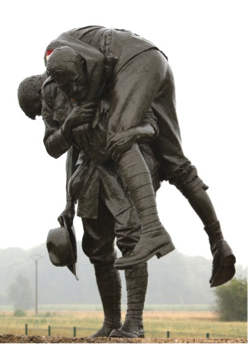 While the Battle of the Somme was raging to the South, a much smaller and little known battle took place near the village of Fromelles, but it was an event which left bitter memories for those involved. As the Somme campaign continued, the Germans began to move troops from the Lille area to reinforce the Somme front. In response to this, the British planned a subsidiary operation in order to prevent further German movements from the Lille sector and to take advantage of what was now seen as a more lightly defended area. Responsibility for this attack fell to the First Army and its commander, Munro, prepared for a two division attack against the village of Fromelles along a 4,000 yard front with the limited aim of taking the German front line system. At the centre of the front to be attacked was a fortified German position on a raised area of ground known as The Sugar Loaf. 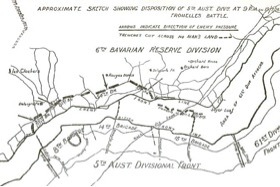 No advantage was gained from the attack and the 61st Division suffered over 1,500 casualties while the Australian 5th Division suffered over 5,500. The battle was one of the most costly of the whole war for the Australians and caused bitter feeling which still echoes in histories to this day.